Tiglath-Pileser I (/ˈtɪɡləθ paɪˈliːzər/; from the Hebraic form of Akkadian: Tukultī-apil-Ešarra, "my trust is in the son of Esharra") was a king of Assyria during the Middle Assyrian period (1114–1076 BC). According to Georges Roux, Tiglath-Pileser was "one of the two or three great Assyrian monarchs since the days of Shamshi-Adad I". Under him, Assyria became the leading power of the Middle East, a position the kingdom largely maintained for the next five hundred years. He expanded Assyrian control into Anatolia and Syria, and to the shores of the Mediterranean. From his surviving inscriptions, he seems to have carefully cultivated a fear of himself in his subjects and in his enemies alike. His first campaign was against the Mushku in 1112 B.C. who had occupied certain Assyrian districts in the Upper Euphrates; then he overran Commagene and eastern Cappadocia, and drove the Hittites from the Assyrian province of Subartu, northeast of Malatia. The Aramaeans of northern Syria were the next targets of the Assyrian king, who made his way as far as the sources of the Tigris. It is said from an Assyrian relief that he campaigned against the Arameans 28 times during his reign from 1115 to 1077 BC. 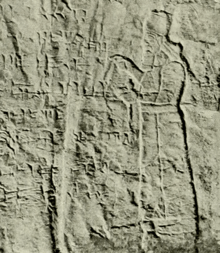 The control of the high road to the Mediterranean was secured by the possession of the Hittite town of Pitru at the junction between the Euphrates and Sajur; thence he proceeded to Gubal (Byblos), Sidon, and finally to Arvad where he embarked onto a ship to sail the Mediterranean, on which he killed a nahiru or "sea-horse" (which A. Leo Oppenheim translates as a narwhal) in the sea. He was passionately fond of the chase and was also a great builder. The general view is that the restoration of the temple of the gods Ashur and Hadad at Assyrian capital of Assur was one of his initiatives. ↑ In English, any of the following four pronunciations are used: /ˈtɪɡləθ paɪˈliːzər/ TIG-ləth py-LEE-zər, /ˈtɪɡləθ pᵻˈliːzər/ TIG-ləth pə-LEE-zər, /ˈtɪɡˌlæθ paɪˈliːzər/ TIG-lath py-LEE-zər, or /ˈtɪɡˌlæθ pᵻˈliːzər/ TIG-lath pə-LEE-zər. ↑ The encyclopædia britannica: a dictionary of arts, sciences, literature and general information, volume 26, edited by Hugh Chrisholm, 1911, p. 968.